EDIT: Surprise & Shine is no longer accepting orders for new boxes. I suspect they may have closed the business, but have yet to confirm. 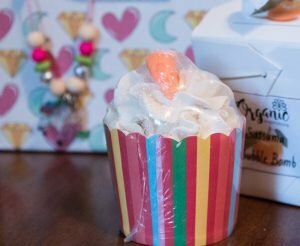 Surprise & Shine Collection is a new subscription box for kids. It’s aimed at girls ages 5 to 12, and if my daughters’ reactions are any indication the goodies inside are right on target. Disclosure: I was given a Surprise & Shine Collection box to review. Some of the links in this post are affiliate links. As always my words and opinions are my own (or that of my kids). I think a month or even two month’s subscription to this fun sparkly box would make such an awesome gift for a little girl. There are so many cool subscription boxes out there, but most of them come from the States. Many won’t even ship to Canada, and those that do charge crazy shipping rates. 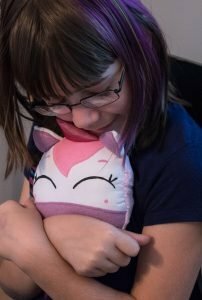 So I was excited to see this CANADIAN subscription box aimed at kids come onto the scene this summer. 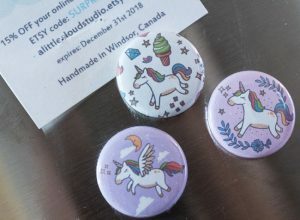 I also love that it’s filled with items from Canadian handmade shops and small businesses. The box, which costs $44.95 and includes free shipping within Canada, claims to have an average retail value of over $100, and I really felt like the value was there. This was NOT junk. 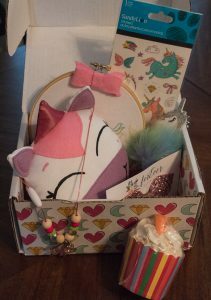 The box was filled with adorable, well made, quality items that my kids squeed over. The only disappointment was the super cute unicorn necklace. It’s has this little clear acrylic unicorn hanging from it that sort of looks like a shrinky-dink. It is so darn cute. And it was far too small to fit over even my youngest daughter’s head (she’s 8). The boxes DOES say ages 5 to 12, and well I guess some items are really intended for that lower age range. While my third grader was sad that the necklace wouldn’t fit her, we came up with a compromise and ended up hanging it off her bedroom curtain rod as a decoration. 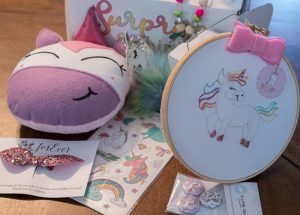 Here’s a complete list of the goodies that were included in our box: unicorn travel pillow, set of three unicorn magnets from A Little Cloud Studio, 1 sheet of sparkly Sandy Lion unicorn stickers, unicorn embroidered hoop from Sprinkle & Shine, unicorn necklace from Sprinkle & Shine, super soft and poofy handmade unicorn bag tag, sparkly hairbow from Forever Baby & Kids, and a cupcake-shaped Satsuma Bubble Bomb from Organic Inspirations. Other cool things to note: A couple of the items included codes for a discount off future purchases. And I secretly loved that one of the crafters featured (A Little Cloud Studio) was from Windsor, Ontario. So, let’s recap: Spend $45 and get a box full of sparkly girlie goodies with a value of roughly $100. And yes, if you’re in Canada that includes shipping. You can sign up for just one month, or for an ongoing subscription. (If you pay up front for a longer subscription you save from 5% to 15%). Be sure to use code WELCOMEBOX10 to get 10% off your Surprise & Shine Collection subscription. This would be a cool gift for my daughter who will be turning 6 soon. I would give thid to my 3 daughters to share. They would be very excited to receive mail of their own every month. Very cool! I have been searching for subscription boxes for xmas this year and could not decide. I found most selections filled with junk for higher prices than you would expect. I love you found a Canadian one. We love Little Cloud Studio. I would gift this to my youngest child whom despite being a”boy” loves sparkles and pink and all things frilly. I would love to get this for my daughter! I would gift this to my niece. She would love it. To my granddaughter who would love it. I would give it to my daughter. She loves cute things. I would gift this to my niece…..I think she is at a great age to really appreciate it! I would gift this to my daughter! I would give this box to my daughter. She would love it! My daughters would live this!! I’d love to give this Surprise & Shine subscription to my two nieces. I would love to win this subscription box for my granddaughter I love these!! This would be an amazing gift for my daughter’s 7th birthday! She would absolutely love it! I’d give this to my nieces! I would gift my daughters with a subscription to the Surprise & Shine Collection – they’d love it! I would gift this to my granddaughter. I would give it to my daughters. I have 4 daughters, 3 within the age range these boxes are for. They love all things sparkly! I would love to gift this to my sister. I’d be the best aunt and give this to my niece! I used to love getting mail as a kid (now it’s just bills). This would be so fun for a kid! If I win I would give it to my 5 and 7 year old girls. Thanks for the chance to win! I would gift this to my daughter, she would absolutely love this. This looks like such a fun subscription! I would love to win it for my niece. I would give this gift to my granddaughter. She’d love it! My little niece would love this!!! I would gift this to my nieces!! My 4-year-old granddaughter would love this! I’d give this as a gift to my nieces. I would gift it to my niece. I would surprise my niece with this. My 7 year old would love this! I’d gift this to my daughter! My niece’s would love this! Thanks! I would gift this subscription to my eldest daughter! I would gift something like this to my niece’s little girls. I would gift it to my 10 year old niece. I would gift this to my close friend’s daughter. She is the sweetest, and would love all of these items! I would probably gift the subscription to my niece! I would gift this to my nephews’s daughter. She would love it!